Petra Bauer from the University of Mainz, Germany visited the University of Aberdeen, Scotland, in April 2017. She saw mobile learning in action during a class in which students presented the findings of personal research to others as a small group activity. On their laptops they used a range of technologies to support their activities including presentation, video and animation software, drawing and quiz tools. Examples included Kahoot (quiz software), Padlet (collaboration tool) and Playbuzz (for interactive storytelling). During the class the tutors took a very ‘hands-off’ role – mostly listening and watching! At the end of the class several learners commented that they had found it useful and one of the most enjoyable sessions in the course. 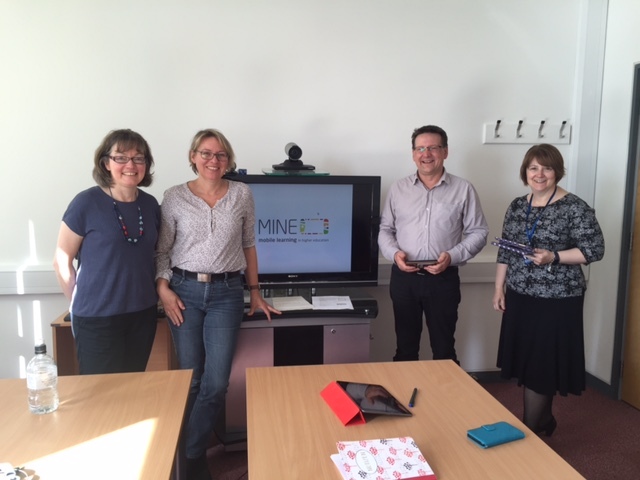 Petra also met with the Scotland MINE team to discuss project progress. Amongst other issues these discussions highlighted the importance of exploring management and technical issues in connection with mobile learning projects. The availability of support and training, for example, can impact on staff willingness to implement mobile learning projects. These issues will be explored further during the MINE project. the lesson you watched seemed to be very innovative with a focus on the learners! Are you going to try some of the things you’ve seen in your own courses?